The Chief Minister, who recalled the condition Telangana State was in at the time of its formation, said the government in the first year was skeptical about the finances, and hence was cautious while implementing welfare schemes. 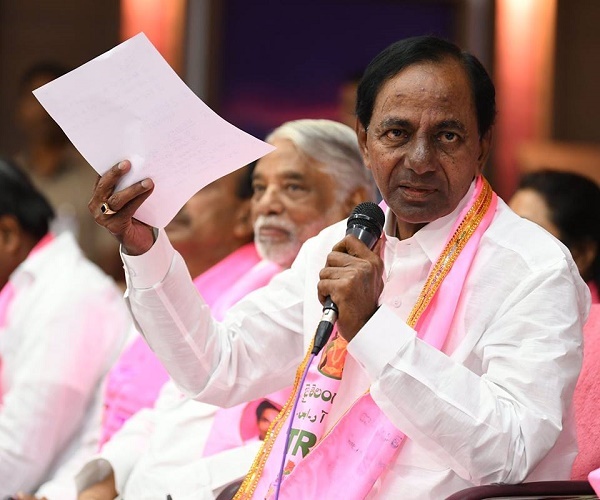 Chief Minister and TRS president K Chandrashekhar Rao on Tuesday announced several new promises and major improvements to existing welfare schemes covering virtually all sections of society, leading to impromptu celebrations by the people across the State. Rs one lakh farm loan waiver to benefit 42 lakh farmers, hike in Rythu Bandhu amount from the existing Rs 4,000 per acre per season to Rs 5,000, unemployment dole of Rs 3,016 without any immediate cap on the number of beneficiaries, doubling of pensions under Aasara, a bouquet of pension schemes, bringing down the age limit for old age pension from the present 65 years to 57, corporations for Reddy and Vysya communities with sufficent corpus funds, providing teeth to the Rythu Samanvaya Samithis to make them vibrant bodies to make agriculture a profitable venture were some of the major announcements made by the TRS president. Chandrashekhar Rao made it clear there was more to come since Tuesday’s announcements were only part of the manifesto. “The final manifesto will be made public after the Dusera festival,” the Chief Minister said during the 90 minute press conference after participating in the party’s Manifesto Committee meeting at Telangana Bhavan. The committee, he said, had received over 300 representations from various sections of society and all the issues were discussed. Decisions were taken on some key issues while the others would be addressed in the final manifesto, he said. The TRS president said the age limit for old age pension would be brought down to 57 years from the existing 65 years, which would bring another eight lakh elderly persons under its umbrella. While the pension amounts under Aasara scheme would go up from Rs 1,000 to Rs 2,016 for various sections, the pension amount for the differently abled would be hiked from Rs 1,500 to Rs 3,016. Eligible persons who have land of their own will be given funds for construction of 2BHK houses, and this will be in addition to the existing scheme of providing 2BHK houses for the poor. The Chief Minister also assured that that corporations for Reddys and Arya Vyasyas would be set up with sufficient corpus funds. Chandrashekhar Rao rued that the State had not received any support from the Centre in the past four years, despite an organisation like Niti Aayog recommending Central support of Rs 24,000 crore for irrigation schemes. “Leave alone Rs 24,000 crore, the State did not receive even Rs 24 from the Centre,” he said. Tracing the success story of the TRS, Chandrashekhar Rao recalled the initial scepticism when the TRS took over the reins of administration of the new State, the promises to be kept, the unknown path the government was treading without having clear cut idea of the financial health of the State, and the subsequent confidence the government gained as each year passed. “Year on year, we gained experience that emboldened and encouraged us to not only implement the poll promises, but also reach out to the people with innovative schemes that were not part of the 2014 manifesto. By the third and fourth year, Telangana was marching ahead and had occupied number one position on various fronts including economic growth, and mind you, it was without any support from the Centre,” he said. The TRS government, he recalled, was cautious while implementing a scheme like Kalyana Lakshmi, extending it to only some sections of society, but later enlarged it to cover all the poor families in the State once the State was confident that it could handle it. “We went into future implications, and decisions were taken on the basis of rational thinking. TRS is a party that achieved Statehood and it had an objective. Governance for us is a task unlike other parties that consider it politics. Whatever we say and promise, we implement,” he said.